I would like to tell you all about Mum's hugely big heart and utter devotion to and consideration for the welfare of us, her boys. This could range from the simple act of mending and adapting our clothes, to keeping aside and sometimes buying or getting for one of us some particular item that she just knew we'd need or appreciate....even if we didn't know we did ourselves! Then of course for our general welfare as a whole she was always gratifyingly supportive of our lives and careers, where-ever they took us, and fantastically interested in them and knowledgeable about the latest developments at all times....sometimes even to the extent of reminding us of some details in our own lives that we'd forgotten. However, she was also there for us all with loving care and concern when less fortunate times struck us, personally or professionally, and in the case of Tom and myself, when we suffered various physical setbacks. 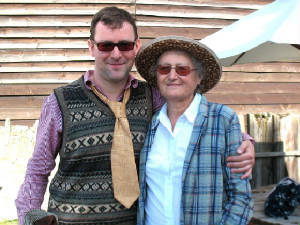 Between us we've notched up a pretty impressive catalogue of broken arms, broken legs, burnt limbs and split chins over the years, and it was always the loving care and support Mum gave us, even when in the case of my injuries a certain amount of foolishness was to blame, which we'll remember as the best medicine of all. For me I will always vividly recall how when I arrived home from university with my burnt leg, the first thing Mum did was to just sit with me for 20 minutes or so saying nothing, but holding my hand very tightly and patting me with such palpable love and concern. Sometimes you might even say she went above and beyond the call of duty in showing such caring qualities, as demonstrated by the famous Bovril incident -- now legendary in family lore! As I remember it, I was making my crumpets for breakfast one morning before going to school, with the morning BBC news on in the background -- I think the story they were covering was the unfolding BSE crisis.....Next thing I know, whilst about to apply a knife to the crumpets, a flurry of dressing gown whirls past me and in one swift move my mum had removed the jar of Bovril I was about to use and deposited it in the bin! And from that day forth we never had Bovril in the house again! So finally, to finish our tribute to Mum, what more fitting thing could we do than fulfill what would undoubtedly be her wish and indeed her expectation of that which must happen on any celebratory occasion that brings her four sons, and family, and all of us together, and it's something that rings true with what everyone in this room knows: that Mum put the family at the centre of her life, in this case family photos: specifically a picture to join the collection of all the others from across the years, of her four sons together. So Dad, and Candy and Frances, just as you've been asked to do so many times before when we've stood at various locations from the steps outside Aberdeen Park, to Hong Kong, to the arch at the Gatehouse here in Shipton, please will you come forward and as our final tribute to Mum today, take yet one more picture of her four sons together.... the four brothers, in memory of our dearly loved and missed Mum.